The conflict between Hamas and Israel was a practice run for a confrontation with Iran, featuring improved rockets that can reach Jerusalem and new antimissile systems to counter them. Iran preoccupies Prime Minister Benjamin Netanyahu and President Obama. A key to their war-gaming has been cutting off Iran's ability to slip next-generation missiles into the Gaza Strip or Lebanon, for launching by Iran's surrogates Hamas, Hezbollah, and Islamic Jihad. Israeli ambassador to the United States Michael B. Oren: "In the Cuban missile crisis, the U.S. was not confronting Cuba, but rather the Soviet Union. In Operation Pillar of Defense, Israel was not confronting Gaza, but Iran." The first strike in the new conflict between Hamas and Israel arguably took place in October in Khartoum, the capital of Sudan. A factory said to be producing light arms blew up, and Sudan charged that it had been hit by four Israeli warplanes. Israeli and American officials maintain that Sudan has long been a prime transit point for smuggling Iranian Fajr rockets, the kind that Hamas launched against Tel Aviv and Jerusalem. The missile defense campaign that ensued over Israeli territory is the most intense yet in real combat anywhere. It could change warfare in the same way that air power in the Spanish Civil War shaped combat in the skies. A conflict with Iran would look different. But in the Israeli and American contingency planning, Israel would face three tiers of threat in a conflict with Iran: the short-range missiles that have been lobbed in this campaign, medium-range rockets fielded by Hezbollah in Lebanon, and long-range missiles from Iran. The last of those three could include the Shahab-3, the missile Israeli and American intelligence believe could someday be fitted with a nuclear weapon. A historic battle of missile versus missile defense played out in the skies over Israel, with Israeli officials saying their Iron Dome system shot down 350 incoming rockets, 88% of all targets assigned to the missile defense interceptors. Before the conflict began, Hamas was estimated to have amassed an arsenal of 10,000 to 12,000 rockets. Israeli officials say their strikes on Hamas rocket depots severely reduced the arsenal. And most of the approximately 1,500 rockets fired by Hamas in this conflict were on trajectories toward unpopulated areas. Iran is certain to be studying the apparent inability of the rockets it supplied to Hamas to effectively strike targets in Israel. Israel currently fields five Iron Dome missile defense batteries, each costing about $50 million, and wants to more than double the number of batteries. Replacement interceptors cost tens of thousands of dollars each. Iron Dome counters only short-range rockets with a range up to 80 km. 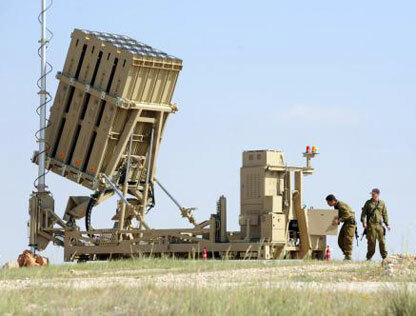 Israel is developing a medium-range system called David’s Sling and has fielded a long-range system called Arrow. In military terms, the conflict between Israel and Hamas is asymmetric. Israel Defence Forces used fighter jets, drones, precision guided missiles, tanks, heavy artillery, and naval vessels to pound the Gaza Strip, drawing on years of work by Israeli intelligence officers. The Hamas military wing and other militant groups have fired an intense barrage of rockets and missiles at Israel. Both Jerusalem and Tel Aviv have come under fire, though most of the missiles either landed in open fields or were intercepted by Iron Dome. Institute for National Security Studies analyst Yiftah Shapir: "This is a classic example of asymmetric warfare. This is the type of warfare that takes place not on the ground but on TV and computer screens all over the world. One side is trying to show the world how miserable and how much of an underdog they are, while not being afraid and not losing." Retired Israeli general Shlomo Brom: "This is the kind of encounter that cannot end with a knockout. It ends with both sides counting the points that they have achieved. The problem is that this is too complicated for the Israeli public. The people want a victory and they don't understand that there are no victories in these conflicts." Yedioth Ahronoth columnist Sever Plocker: "How does it happen that the mightiest and most technological army in the Middle East is incapable of overcoming 5,000 uneducated, young Palestinians lacking military expertise?" Almost everything has changed in the Mideast. Benjamin Netanyahu has not. He lives in the shadow of a war hero brother and a father who believed Arabs would never make peace with Jews. As long as Hamas can be cast as terrorists, he can refuse to talk peace. The strategy has run out of road. Netanyahu is creating facts on the ground. His settlement policy has left the West Bank resembling a Bantustan from the apartheid era. His supporters say it will soon be impossible for Israel to hand back the land. But Israel is running out of friends. The parallel with Iran is uncomfortable. Ayatollah Khamenei is a fellow reactionary. He shares the view that military force is a source of security. Tehran sees a nuclear capability as an insurance policy against outside threats. The era of the armed reactionary is coming to a close. The events in Gaza have transformed the fortunes of many in the Mideast. Egyptian President Mohamed Morsy deftly navigated a minefield of competing interests. He brought Hamas to the table and got its leadership to agree to a cease-fire. Brokering that deal has given him political capital in both the Arab world and the United States. Woodrow Wilson Center Mideast scholar Aaron David Miller: "For a civilian president in Egypt perceived as a weak leader, he has, much to everyone's surprise, delivered." Israeli Prime Minister Benjamin Netanyahu did well too. His government targeted and killed Hamas military leader Ahmed al-Jaabari. Hundreds of airstrikes on Gaza followed, and Israelis were protected by Iron Dome. Hamas took on Israel more boldly than ever before. They may get an easing of the Gaza economic blockade. Palestinian Authority President Mahmoud Abbas and his Fatah faction can no longer claim to speak for all Palestinians. Miller: "Hamas has emerged stronger, it has consolidated its control over Gaza and it has gained now more legitimacy. Look what they accomplished; they, rather than Abbas, has put the Palestinian issue back on the international stage." Iran implicitly confirms smuggling weapons to Hamas through the Egyptian border. Iranian Revolutionary Guard head Mohamed Ali Jafari: "Gaza is under siege, so we cannot help them. The Fajr-5 missiles have not been shipped from Iran. Its technology has been transferred." Benjamin Netanyahu claims Israel won and its prime minister deserves to be re-elected: "We need to navigate this ship of a state in stormy waters with responsibility and wisdom, that's how a responsible government acts. We've executed a military action but also stayed open for a diplomatic solution." The Israeli press said the Hamas leadership and Egyptian President Mohammed Morsi won. Haaretz analyst Anshel Pfeffer says the crisis has propelled Morsi into the role of an important regional statesman. As the ceasefire was being finalized, President Barack Obama telephoned with Morsi many times. Even Israeli Foreign Minister Avigdor Lieberman thanked Morsi for his role in bringing about a truce. As for Hamas, their rockets rained down on Israel and were able to hit both Tel Aviv and Jerusalem. A clause in the ceasefire agreement calls for a partial lifting of the blockade on Gaza. The Hamas leadership didn't cave and can now pose as negotiating partners for Israel. The Netanyahu administration may have helped a Hamas resurgence. Netanyahu has negotiated with them while ignoring the Palestinian Authority and its President Mahmoud Abbas. Yedioth analyst Alex Fishman: "Hamas has morphed from the enemy that must be brought down to the enemy that is the lesser of two evils." In the Gaza Strip, thousands took to the streets to celebrate what they see as a victory. In the latest fighting in Gaza, Iran casts an ominous shadow. The standoff between Iran and the West over Iran's nuclear program frames Israeli tactics and strategy in Gaza and influences the international response. When Israelis see a rocket launched from Gaza, the thought that one day that rocket could carry a nuclear payload burns hot in their mind. The Islamic Republic of Iran has long armed Israel's enemies. Iran has threatened to unleash attacks against Israel and "wipe it off the face of the Earth" in case of a hit on its nuclear installations. Those attacks could come from Hamas and Hezbollah. The prospect that Iran could hand them nuclear materials is more realistic than a direct nuclear attack from Iran. Israeli air attacks in Gaza depleted a Hamas arsenal it sees as part of Iran's preparations in case of war with Israel. Israeli officials say the missiles launched against Jerusalem and Tel Aviv were made in Iran, shipped in pieces to Sudan and then moved through Egypt and into tunnels to Gaza, where they were assembled with the help of Iranian operatives in Gaza. In October, Israeli fighter jets are believed to have bombed an arms factory in Sudan. The facility is said to have made missiles for Hamas and was operated by Iranian Revolutionary Guards. The Israeli attacks against Gaza destroyed Iran's most dangerous weapons arrayed in Gaza, launched with increasing brazenness by Hamas and Islamic Jihad. Hamas PM Ismail Haniya traveled to Iran earlier this year. The Hamas charter opposes any negotiations with Israel and declares "Israel will exist ... until Islam will obliterate it." The charter also quotes an ancient Islamic scripture about "killing the Jews." A ceasefire agreement between Israel and Hamas is not peace. British experience in Northern Ireland can help: London persuaded the Provisional IRA that it would never be able to shoot or bomb its way into power and opened a political path instead. Israel cannot bludgeon the Palestinians into submission. Israel needs a partner for peace. The Palestinian Authority in the West Bank wants to make peace but is weak. Hamas is strong but will not reject violence. So Israel can work to strengthen the PA or it can work to moderate Hamas. In the fighting, Hamas has again failed to get results. Qatar's prime minister visited Gaza and gave financial support, freeing Hamas from dependence on Iran and Syria. Hamas is in competition with the PA to represent Palestinians. But Hamas is in tune with the zeitgeist and can work with Egypt. Israel can outline a fair and comprehensive settlement and define a path for getting there. In Northern Ireland, the Provisional IRA put down their arms, entered the political process, and reached an agreement. Israel can persuade Hamas to do the same. "Hamas blesses the attack in Tel Aviv and sees it as a natural response to the Israeli massacres." "The bombing must go on. We defend ourselves. We have no other choice." U.S. Secretary of State Hillary Clinton met for more than two hours with Israeli Prime Minister Benjamin Netanyahu. She is expected to meet later with Palestinian Authority President Mahmoud Abbas and Egyptian President Mohamed Morsy. Clinton: "President Obama asked me to come to Israel with a very clear message. America's commitment to Israel's security is rock solid and unwavering. That is why we believe it is essential to de-escalate the situation in Gaza. The goal must be a durable outcome that promotes regional stability and advances the security and legitimate aspirations of Israelis and Palestinians alike." Netanyahu: "Obviously, no country can tolerate a wanton attack on its civilians. Now, if there is a possibility of achieving a long-term solution to this problem through diplomatic means, we prefer that. But if not, I'm sure you understand that Israel will have to take whatever actions necessary to defend its people." Netanyahu said Israel was fighting back with "surgical operations against terrorists at a time when our own population is being bombarded by rocket attacks." Netanyahu: "If we hope to make these tactics illegitimate, they should be condemned in the most forceful terms by all responsible members of the international community. The moment we draw symmetry between the victims of terror and the unintended casualties that result from legitimate military action against the terrorists, the minute that false symmetry is drawn, the terrorists win." Israeli spokesman Mark Regev: "We want a new reality." In a joint press conference with UN Secretary General Ban-Ki Moon, PM Binyamin Netanyahu said: "If a long-term solution can be put in place through diplomatic means then Israel would be a willing partner to such a solution." Egyptian President Mohamed Morsy: "The travesty of the Israel aggression on Gaza will end in a few hours." Hamas spokesman Osama Hamdan: "It's in the hands now of the Israelis. I think the Egyptians are waiting for some support, promised support, from the United States in order to make an end for that." Hamas al Qassam Brigades commander Mohammed al-Deif: "The ground operation that they keep threatening of waging will be the greatest hope to release our prisoners." Thousands of Israeli troops with tanks and armored vehicles are poised on Gaza's borders ready to move in. The Israeli Ambassador to the U.S. Michael Oren said war planning is complete and the troops are ready to move in if necessary. Israel is well aware that a ground invasion would carry broad risks. Palestinian health officials said 104 people have died and another 860 have been wounded in Gaza since Israel began its offensive in response to incessant rocket attacks by militants. Israeli officials say three people have died and 68 have been wounded in Israel as the result of rocket fire from Gaza. Militants in Gaza have fired nearly 1,000 rockets at Israel since the conflict began. Israel has targeted more than 1,300 sites in its bombing campaign. Ambassador Oren said at the current rate of activity military action could last 45 days to 100 days. He said Hamas has 10,000 to 11,000 rockets left. Israeli Deputy Foreign Minister Danny Ayalon said no option had been ruled out and at this stage everything depends on the action of Hamas. A ground decision would be easier for Israel if Hamas were to launch rockets that hit Tel Aviv or caused a high number of civilian casualties. Egypt hopes to broker a ceasefire agreement but talks have hit a brick wall. Hamas wants an end to the blockade of Gaza. Israel fears a renewed influx of weapons to militants. The leader of Hamas rejected demands to stop rocket fire: "We don't accept Israeli conditions because it is the aggressor. We want a cease-fire along with meeting our demands." Israel wants international guarantees that Hamas will not rearm or use the Sinai peninsula for militant activity. 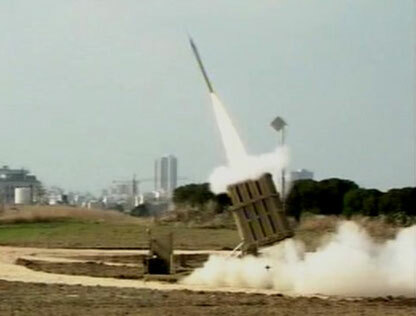 The Iron Dome has its roots in the 2006 conflict Israel fought with Hezbollah in southern Lebanon. Hezbollah launched thousands of rockets, causing huge damage and killing dozens of Israelis. Rafael Advanced Defense Systems developed a new missile defense shield that was tested in combat for the first time in April 2011. During the current Gaza crisis, the system has been highly praised by the Israeli military. By Saturday evening the shield had intercepted 245 rockets from Gaza in three days, and about 90% of the attempted interceptions were successful, the army said. Iron Dome is now deployed over Tel Aviv. The Tel Aviv battery was called into operation shortly after it was installed, killing a rocket on its final approach. Iron Dome is part of a huge infrastructure of missile defense systems operating over Israel, costing billions of dollars. The Americans set aside more than $200 million to help Israel pay for the system. It uses radar to track incoming rockets, and then fires two interceptor missiles to knock them out. Each Iron Dome battery costs about $50 million to install. There are five batteries in operation, with eight more planned by next year. Each interceptor missile costs roughly $60,000. The makers say it is cost-effective because the radar technology distinguishes between missiles likely to hit built-up areas and those missing their target. Only those heading towards cities are targeted and shot down. "In my talks with leaders, I emphasize the effort Israel is making to avoid hitting civilians, and this at a time when Hamas and other terrorist organizations are making every effort to hit civilian targets in Israel." Violence between Israel and the Hamas-controlled "statelet" of Gaza serves domestic politics. Palestinians fear that the Israeli government is making war with an eye to upcoming elections. Israelis suspect that Hamas — "Islamic Resistance Movement" — is lobbing rockets because it is tired of taunts that it is not living up to its middle name. Both sides know they cannot win. The Israelis cannot dislodge Hamas from Gaza without unacceptable cost and endless occupation. But they want to punish the movement to deter it from future violence. Hamas knows that the damage it inflicts serves no strategic value, but it hopes that its rockets will cause dislocation and panic in Israel. The United States will be seen as complicit in the Israeli offensive. Egypt, which now tilts toward Hamas, is embarrassed. The United States has pretended that the Israeli-Palestinian issue could be dealt with as if Hamas does not exist. But Hamas dominates Gaza. The movement runs everything in Gaza. Gaza residents see no alternative. Israel's Deputy Prime Minister Dan Meridor said Israel felt compelled to respond to relentless Palestinian rocket attacks into southern Israel. But Palestinians in Gaza say that what the Israeli military calls surgical strikes kill civilians and they are cut off from the world by a blockade. This is the most serious Israeli offensive on Gaza since 2009. Israel's military says preparations are being made for a ground offensive, should the need arise. Already this offensive is causing regional rifts. Egypt was so angry it has recalled its ambassador to Israel. Regionally, the Mideast is looking more and more unstable. The Syrian civil war is spilling over into Lebanon, the Golan Heights, Jordan, and Turkey. Israeli concern about Iran's nuclear program and the possibility that it will strike Iranian nuclear facilities are adding to tensions. The moribund Mideast peace process is suffering another setback. Some accuse Israeli Prime Minister Benjamin Netanyahu of launching this offensive to benefit politically from taking tough action against Hamas. Peace talks between Israel and Fatah or Hamas look unlikely. Hamas felt confident over the ascendancy of its fellow Islamists in the region and attempted to set new rules on the Gaza border. But it mistook Israeli restraint for weakness. By firing more and more indiscriminate rocket barrages into Israel, Hamas overplayed its hand. Israel once again has proved its intelligence capabilities in Gaza not only by targeting Ahmed Jabari but also by removing most of Hamas' long-range underground rocket launchers in the first wave of air strikes. Operation Pillar of Defense shows Israel will defend its civilians. The Israeli Air Force has hit 20 underground sites housing long-range launchers capable of striking Tel Aviv and killed Hamas military head Ahmed Jabari in Gaza. Hamas says Israel "opened the gates of hell" with the killing. IDF spokesman: "The first aim of this operation is to bring back quiet to southern Israel, and the second target is to strike at terror organizations."